Bearded irises are comfortable as far north as the Great Lakes and central New York, surviving into New England in the milder coastal regions (zone 4). They can take winter temperatures as low as – 20°F. Some types are adapted to the very warm areas of southern Florida as well. Prior to spring blooming season, irises come from the the garden center in pots. 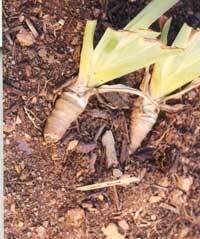 After June newly divided bare rhizomes (bulbs) are available. Plant bearded irises in the late summer at least 6 to 8 weeks before the ground freezes. Choose a sunny location where the soil drains well. Like most bulbs, irises dislike wet, clayey soils. To improve poor drainage, build iris beds higher than the surrounding soil surface. Adding lots of organic matter (such as chopped leaves, sand or peat moss) to the soil will improve its ability to drain. These irises are well adapted to a wide range of soils, but prefer soil that is neutral to slightly acidic (pH 7.0 to 6.5). Loosen the soil 1 foot deep when preparing the bed for planting. When planting potted irises, set the plant in a hole to a depth equal to that of the pot. Rhizomes resemble tan, knobby carrots with roots hanging off one side. When planting bare rhizomes, dig a furrow in the soil and lay the rhizome on its side so that the roots fit in the shallow furrow. Cover the roots with soil, leaving one-third of the top side of the rhizome just above the soil surface. Space them about 12 inches apart.